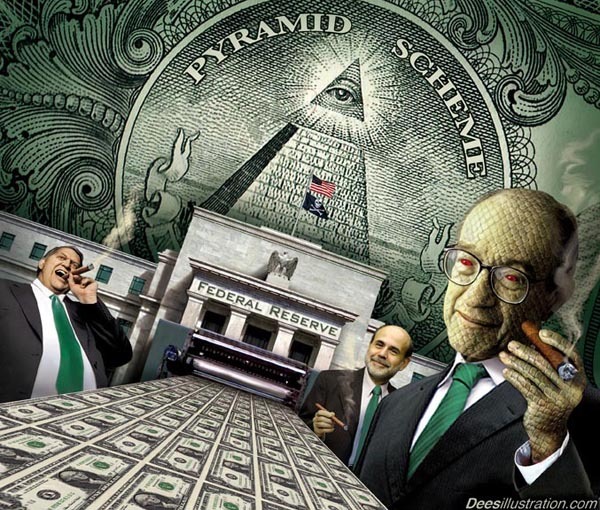 The Federal Reserve: The Biggest Scam In History The Federal Reserve is no more “Federal” than Federal Express. A month ago two billionaires began a public dialogue that can enlighten us all about the Dark Corners of the American government. It began earlier this month when Hugo Salinas Price noticed that the reserves of Central Banks around the world had declined by a trillion dollars. Central Banks had dumped a trillion dollars in US government bonds in the 17 months ending January 8, 2016. Normally that kind of fire sale of assets would have taken down the US and global economies. Another billionaire had an answer. Rob Kirby said the US Exchange Stabilization Fund bought that trillion dollars in bonds. The Exchange Stabilization Fund was created in 1934. It is above the law and any Congressional oversight. The CIA has been subject to Congressional investigation but never the ESF. It was initially funded when FDR asked Americans to turn in their gold coins that were valued at $20.67 per ounce. The dollar was devalued to $35 which gave the ESF a paper profit of $2.8 billion. The Treasury Secretary appointed a manager for the ESF. The first man to run the ESF was Harry Dexter White who worked closely with Secretary Henry Morgenthau Jr. Soviet documents proved that White was a Soviet spy. White served on 18 government boards including the one that ran OSS Black Ops financing. He sent $50 million to China in 1940 to fund the war against Japan. White also helped create the IMF and the World Bank. He won the battle with John Maynard Keynes to make the US Dollar the world’s reserve currency at Bretton Woods in 1944. This had severe ramifications for the Dollar and later might have became one of the reasons why President Kennedy was assassinated. The ESF took over Black Ops financing for the CIA when it replaced the OSS. In 1948 the ESF delivered $10 million in cash which CIA handed out to politicians in Italy to make sure the ‘Good Guys’ won the elections. The ESF funded regime change all over the world. And when it came time to import heroin from the Golden Triangle to the US during the Vietnam war, the ESF was there along side Air America. In the 1960s the American Dollar was experiencing problems. Wall Street had decided to over populate the country so America had to run deficits to pay for the importing of raw materials that were not needed when the population was only 150 million people. The US was also supporting hundreds of military bases overseas and funding regime change. The ESF developed a work around through the IMF to pay for military coups and counter revolutions. The ESF would front the coup leaders cash which was subsequently written up as an IMF loan. The ESF would ask that these loans be paid back in foreign currencies so the US Treasury through the New York Federal Reserve Bank and its 21 primary dealers could manipulate currencies to make the dollar look good. Other sources of income for the ESF’s market manipulations of gold and currencies were the illegal drug and weapons trade. It was the ESF through the CIA that set up the infrastructure for the major Drug Cartels. My regular readers know that the Big Banks launder a trillion dollars a year in illegal drugs and weapons sales. They also launder $500 billion a year in political bribes. In the summer of 1963 President Kennedy had decided to change the way international monetary policy was conducted to cure our continual trade deficits. He wanted to bring in foreign countries and to make the operations of the ESF, the Federal Reserve and the Treasury Department transparent and open to public inspection. This decision died with JFK’s assassination. President Kennedy was killed on the 53rd anniversary of the first meeting held in 1910 to draft the legislation that became the Federal Reserve Act of 1913. Other reasons given for the assassination of JFK were his opposition to Israel’s acquisition of nuclear weapons. And some wanted the US to go into the Vietnam war and lose it so we could hook the younger generation on drugs and make trillions of dollars from the addicts and the systematic destruction of our cities. The decision to keep ESF’s operations a Dark Secret had disastrous consequences for the Dollar. Robert Roosa was Undersecretary of the Treasury for Monetary Affairs under Kennedy and then Johnson. As head of the ESF, he decided to issue US Treasury bonds which were payable in Swiss Francs. They were called Roosa bonds. They were a disaster as the Swiss franc went up in value. The ESF also bet against the German mark which proved to be another losing proposition. They also participated in the London Gold Pool which tried to keep the price of gold down by dumping US gold onto the markets. This also was a disaster as gold kept going up while the Dollar kept going down. Please note that Roosa was a former NY FED VP and later became a trustee of the Rockefeller Foundation and a member of David Rockefeller’s Trilateral Commission. Roosa’s boss was Douglas Dillon who was a boyhood friend of the Rockefeller brothers. His father was Jewish and had changed the family name to Dillon. Dillon went on to serve as President of the Rockefeller Foundation. There were some Dark Days for the Dollar in the late 1960s through the 90s. The ESF did make a lot of money from the Drug trade. In 2001 the Bush administration had decided to invade Afghanistan even before Israel did 911 to blame it on the Muslims so we could spend $6 trillion on wars for Israel. That decision to invade Afghanistan was made because the Taliban had eradicated most of the opium crop which threatened the Narco Dollar. The Narco Dollar allows the US to print money by the trillions and to send them overseas to finance drug shipments and pay ten billion dollars in bribes every week. Keeping that money overseas lowers inflation in the US. The invasion of Afghanistan was good for the US Banks. The Bankers started printed Super Notes which were authentic looking counterfeit $100 bills. They were updated dozens of times to keep them looking good. The US propaganda machine blamed Russia and then Iran. The Super Notes were not made good enough to be accepted by the Federal Reserve or any major Central Bank. That was so holders of Narco Dollars would be too frightened to try to redeem them at a Central Bank thus keeping all that money overseas. Bringing Narco Dollars home would destroy the American economy overnight through inflation. There are other sources of money for the ESF. $8.35 trillion went missing from the Pentagon since Clinton was President. We should expect some of that money to have made its way into that ESF slush fund to cover bad Wall Street investments and a weakening Dollar. Other federal agencies have seen money walk out the door but not to the level of the DOD. There are $225 trillion plus dollars in speculative bets made against a rise in US interest rates. The ESF and the Federal Reserve are likely behind this wild speculation. The premiums from the sale of more than $225 trillion in CDS was split up amongst the ESF and the major banks. These premiums gave the banks and the ESF tremendous assets which they could use to buy that trillion dollars in US Treasury bonds. A couple of years ago the Federal Reserve told the major banks to write living wills. This meant that banks were to separate their assets into several different corporations. Depositors’ money and all of those risky Credit Default Swaps (CDS) and those fraudulent Mortgage Backed Securities (MBS) were put in the same section of the sinking ship as the FDIC taxpayer guarantees. The Central Banks including the Federal Reserve have decided that when the next crash comes depositors will be treated like investors. Deposits will be taken to cover losses. Of course the losses are far greater than the deposits in a fractional reserve system. That means the Central Banks will have to Hyperinflate currencies to protect the Uber Rich. A Bank Holiday will rob everyone of what little money they have. After 90 days of unbelievable price increases, money from that savings account will be nearly worthless. Bankers changed US law. It is now the law that the banks obligation to pay for a CDS loss is greater than your demand as a depositor. This means speculators are to be paid before you get your deposit back. Dr Jim Willie has noticed some rather strange events in the Treasury bond market at the level of the New York Fed and the 21 primary dealers. I think the ESF is involved as well. It seems that $3.5 trillion in US Treasury bonds were sold that were not issued by the Treasury. He compared the US budget deficit to the sales of Treasury bonds and found a discrepancy. Maybe that was the ESF acting through the NY FED to fund Black Ops and market manipulations. The ESF is the lost likely candidate as the source of the funds to purchase a trillion dollars in dumped Treasury bonds. But how much longer can this continue? Nobody knows how many more trillions the ESF still has. The Dollar is the only strong currency but that is all due to manipulation and fraud. When the Dollar Dies, we will see an overnight devaluation and the beginning of Hyperinflation. There will be Nationwide Food Riots. I seriously doubt we can make it to election day 2016 without a collapse if we do not have Debt Cancellation. I could be wrong. We might last until 2017. We need to arrest the Bankers and seize their assets before they destroy the world. We can use the money they stole from us to liquidate all the Unpayable Debts they created through fraud. The alternative is that we let the Bankers starve a few billion people to death and issue a cashless digital currency that would give them the Divine Right of Kings to rule over us. Let me close with something I have not said for awhile. Israel sent the head of their Central Bank, Stanley Fischer, to run our Federal Reserve when the Dollar Dies.